We are located just 100 meters from the pedestrian zone. We offer special prices for our guests in our traditional Inn – Gostilna Pod vrbo. We offer free wifi everywhere in the hostel. Bikes are available for rental at Bicikelj. Dogs are welcome and safe at our hostel (in private room). By prior arrangement we can prepare breakfast, lunch or dinner at our restaurant. Treat yourself with an unforgettable retreat for two and spend it among illusions. Especially for our hostel guests we have prepared menus with typical Slovenian food at our traditional Inn – Gostilna Pod vrbo. We are located in a quiet and green part of the city center, in an area where once grew mighty and friendly willows. It takes a 25 minute pleasant walk by the Ljubljanica river to reach our hostel from the main bus and train station and just a 5 minute drive from the highway. The name Vrba in translation means Willow tree. The part of Ljubljana where we are located is very romantic – our hostel is actually just meters away where the most famous Slovenian poet, France Preseren, met his love Julija. For the architecture fans – we are also just meters away from the birthplace of the world-famous architect Joze Plecnik. We are also very fortunate to be situated in a beautiful, green part of Ljubljana, where the city’s iconic Ljubljanica river meets the smaller Gradascica. This leaves a magical, peaceful ambiance especially first thing in the morning as the city slowly comes to life. We offer comfortable private twin rooms and women’s and mixed dormitories with shared bathrooms. 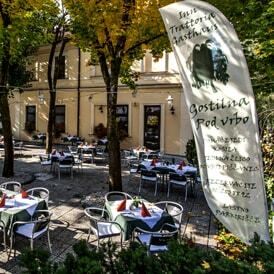 For the full experience of Slovenia and its capital city, but especially for our guests we offer a typical Slovenian dishes in our traditional guesthouse Pod vrbo (Under the willow tree). 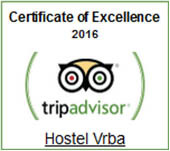 We had a wonderful time at your hostel and the food in your Gostilna Pod vrbo is delicious.